This home is situated on a popular family gated resort, ideal for children. It's a 5 minutes walk to the supermarket and restaurants. 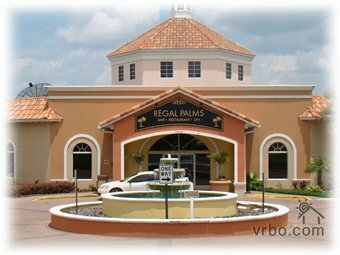 Visitors to the Resort have the added bonus of being only minutes away from, shopping malls,outlet malls, and due to it's location, there is no other home that equals this home on the resort, being the closest to the amenitiesof Regal Palms. Disney Maingate to Magic Kingdom & Epcot is just a short 15 minute drive away as are most of the Disney Theme Parks. Enjoy the Harry Potter Experience at Universal Studios. For over half a century Gatorland as been creating fond vacation memories for millions of visitors, located between Orlando & Kissimmee on the South Orange Blossom trail. Florida has so many places to explore if the Themeparks are not your vacation pleasure. Bok Tower and Gardens are just a few miles down the US 27 south. There are many many golf courses for the avid golfer with the absolute closest being the Championship course of Highlands Reserve, just across the road from the resort. In the Fall and at the Christmas Holiday Season there are the Falling Leaves and Snow Fall on the hour every hour at Celebration, where there is an abundance of eateries from All American to Japanese, Italian and French cruisine. Celebration is a favorite place to hire bicycles and take a leisurely ride round and see the spectacular homes there. The beaches of the Atlantic coast or the beautiful blue waters of the Gulf are equally one and a half hours drive. Vist little Greece at Tarpon Springs, there is just so much to do in and around Orlando/Davenport/Florida, and all from a very central base of Regal palms Resort and Spa.